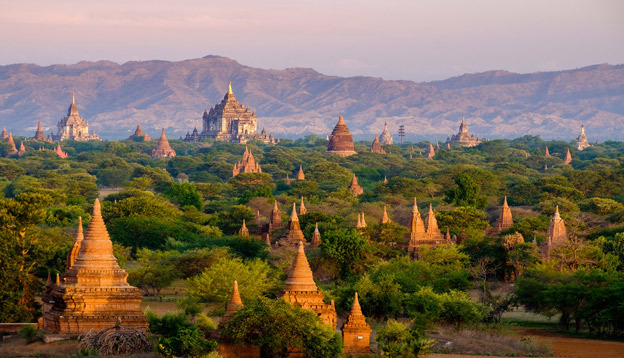 Is it Safe to Travel to Myanmar…and should you? The ongoing internal conflict in Myanmar has had disastrous effects on the country’s tourism influx and, although it is perfectly safe for foreign tourists to visit, many potential visitors are still hesitant about booking a tour. So, we take a closer look at the problems plaguing the country and aim to dispel any fears you may have: travelling to Myanmar, right now, is perfectly safe. And, perhaps more importantly, should you? When trying to ascertain the safety levels of a particular destination, it’s important to focus on the details and the official recommendations, rather than succumb to media hype. Getting swept away along with incorrect or generalised reporting can have disastrous consequences, not only for the country’s inhabitants (many of whom rely on the tourist industry to survive) but also for potential visitors. If you’re reading this, it’s safe to say you have an interest in discovering this truly remarkable country and missing out on the experience does you (and Myanmar) a great disservice. According to SmartTraveller, a website operated by the Australian Department of Foreign Affair and Trade, the conflict in the country is exceptionally localised, with the highest degree of caution reserved from border areas near China and India and, particularly, the Rakhine State bordering Bangladesh. 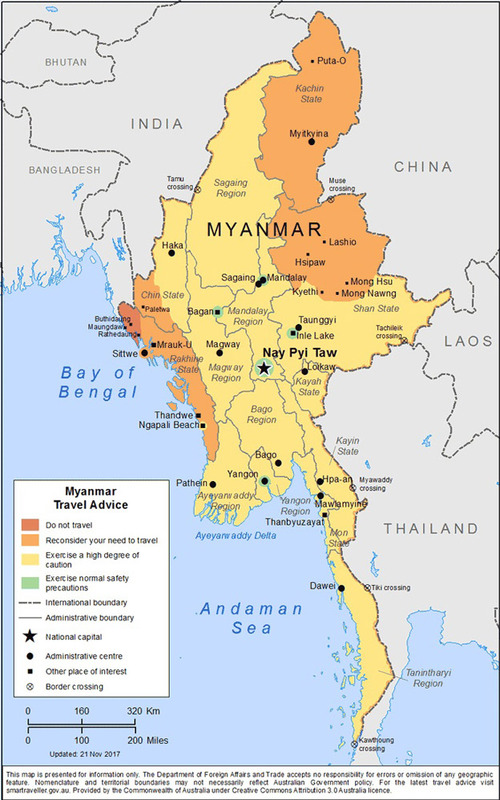 The Myanmar Government restricts travel to these regions and advises travellers to restrict road travel, if possible, outside of the tourist highlights. We urge you to follow the guidelines set out not only by the local government but also foreign ones, including the UK Foreign Office. All of them still state that normal travel safety precautions should be taken when travelling through most of the country and that the tourist hot-spots, the so-called ‘green zones’, have been unaffected by the recent conflict. 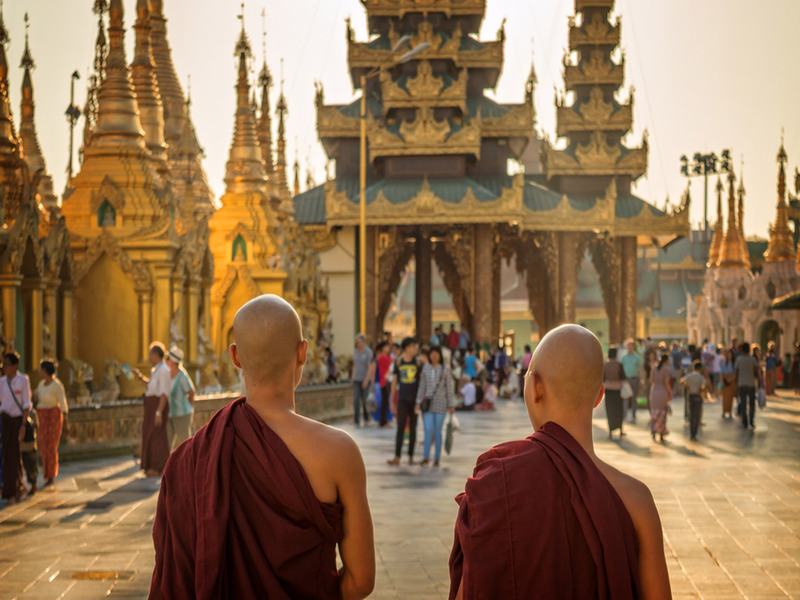 Most visitors are enjoying trouble-free visits through Myanmar and the most common reasons for requiring consular assistance are due to petty theft and loss of passport. As you can see on the above map, tourist destinations like Yangon, Bagan, Inle Lake, Nay Pyi Taw and the cruise route along the Irrawaddy River are safe to visit and there have been no reports of tourists having difficulties related to the military conflict of the country’s border regions. As in most situations of this kind, the popular tourist centres remain unaffected and travelling to these destinations and their surrounding areas is as safe as it’s always been. The one main consequence felt by those visiting is that they’re finding locals exceptionally friendly, open and helpful. Fearful of being once again plunged into international isolation and anonymity has made local Burmese, a normally already-friendly lot, even more hospitable. Whenever possible, we employ local private tour operators – as opposed to government-run agencies – to ensure your tourist dollars reach those who need them most: locals, most of whom can do nothing about the conflict in their country’s border regions. Events over the last two years have dealt a major blow to Myanmar’s reputation and have yet again plunged the country into international controversy, something it had fought hard to overcome for decades. Tourist flow had only just started to reach the Rakhine State, for example, a region which, right now, is a no-go zone. Ironically enough, the benefits of international tourism – and increase in dollar flow – had just started to dissipate antagonism and conflict in the area. Years of sanctions and tourist boycott had caused a great deal of suffering among ordinary people. For many foreigners, however, visiting Myanmar has now become a moral question and although the initial instinct is to boycott the country, it is important to understand a few facts. 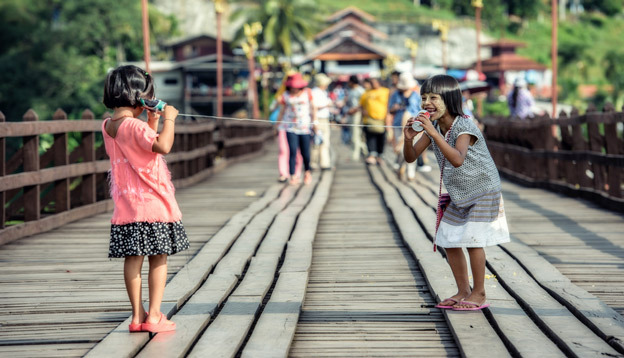 Ordinary Burmese citizens, of different creeds and ethnicities, have been suffering a great deal (directly and indirectly) from the latest downturn in the tourist flow. People here are desperate to preserve their country’s reputation and strive to get the message out that ‘YES! It is safe to visit!’ Governments worldwide agree: boycotting Myanmar only helps to further damage the country and its people. A severe decrease in tourism flow will undoubtedly, and eventually, cause countrywide job losses, possibly inciting animosity against the Rohingya minority. Whilst international pressure on the local government mounts it is important to understand that visiting Myanmar supports everyone there, including Rohingya Muslims. Keeping away, on the other hand, does not help them at all. Whatever you do, don’t give up on Myanmar now. If you’ve been dreaming of visiting this ancient and mysterious land, brimming with innumerable priceless treasures, there has never been a better time to visit. Support locals in their struggle for inclusion, preservation and peace and come discover one of the most magical destinations you’ll ever have the privilege of visiting. Our tours of Myanmar include air-travel between all the major sights and offer a wealth of options for exploring the surrounding (and safe!) areas. Our Mandalay to Bagan Irrawaddy Cruise is now on sale, offering yet another incentive for visiting. Read our Things to Do in Myanmar to get a detailed overview of all the magnificent highlights this country has to offer and do know that our local and trusted operators will do their utmost to deliver an exceptional experience. Organised and bespoke tours are the best, safest and easiest way to experience beautiful Myanmar. Contact us for more info and help in planning your trip.